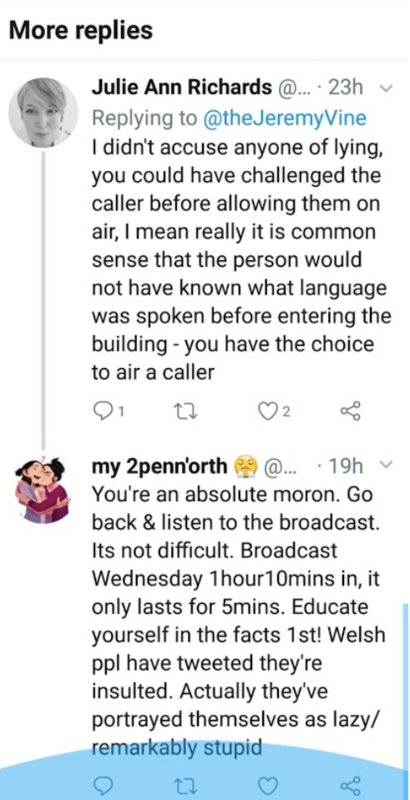 Special news; our correspondent, Peter Mescall, has been in contact with Jeremy Vine after the recent language debate on Twitter. 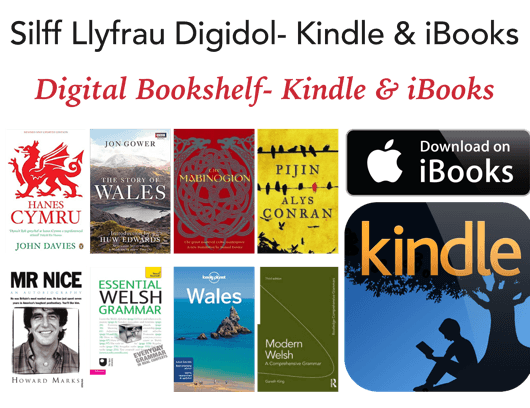 Mr Vine presents a program on Radio 5 and was reviewing the year; a caller criticised the Welsh language, with an example about people who change to Welsh instead of continuing in English when English speakers enter a pub. Jeremy Vine received a message on Twitter; the user was not happy with the program and the discussion then deteriorated. Mr Vine tried to resolve the situation, but the image used on Twitter didn't help- unfortunately, the title and image of the article wasn't suitable and Mr Vine then received a lot of criticism. That's when our correspondent and many others, for example, Say Something In Welsh's Aran Jones, sent messages to Mr Vine. Aran shared his views on nation.cymru and our correspondent then received a message from Mr Vine. 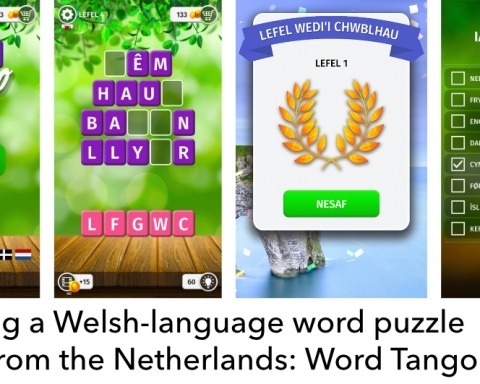 Despite the criticisms, Mr Vine realises that the most of the community is happy with his support and recognise that he is a person who appreciates languages ​​and culture. 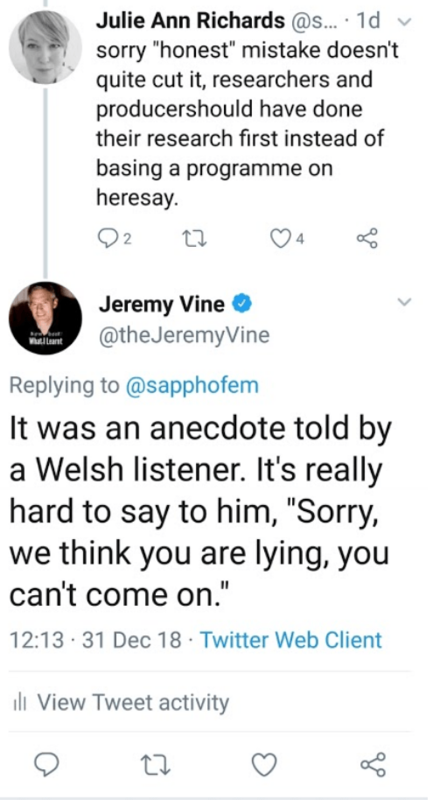 After discussing the situation, our correspondent is happy to say that Mr Vine is honest, and parallel.cymru is proud to have the opportunity to present his experience. Newyddion arbennig; mae ein gohebydd, Peter Mescall, wedi bod mewn cysylltiad efo Jeremy Vine ar ôl y ddadl ar Drydar. Mae Mr Vine yn cyflwyno rhaglen ar Radio 5 ac oedd o’n adolygu’r flwyddyn; oedd galwr yn beirniadu’r Gymraeg, gan ddefnyddio'r hen stori am bobl sy’n newid i’r Gymraeg yn hytrach na defnyddio Saesneg wrth i siaradwyr Saesneg fynd i mewn i dafarn. Mi wnaeth Jeremy Vine dderbyn neges ar Drydar; doedd y defnyddiwr ddim yn hapus efo’r rhaglen, ac wedyn aeth pethau’n waeth. 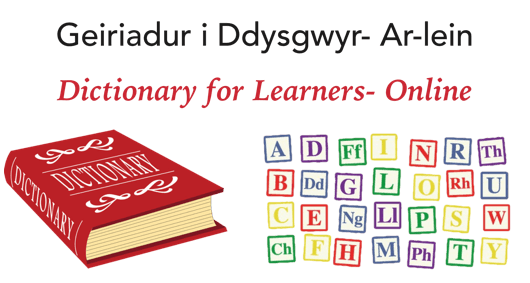 Roedd Mr Vine yn trio datrys y sefyllfa, ac mi wnaeth o roi dogfen ar Drydar er mwyn helpu’r sefyllfa. Yn anffodus, doedd y delwedd a llun yr erthygl ddim yn addas ac wedyn mi wnaeth Mr Vine dderbyn llawer o feirniadaeth. 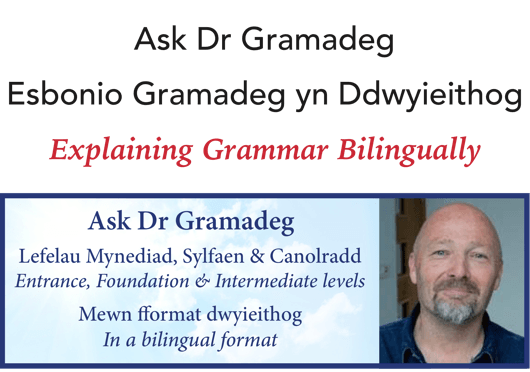 Dyna pryd mi wnaeth ein gohebydd a nifer o bobl eraill, er enghraifft Aran Jones sy'n rhedeg y wefan Say Something In Welsh, anfon negeseuon at Mr Vine. 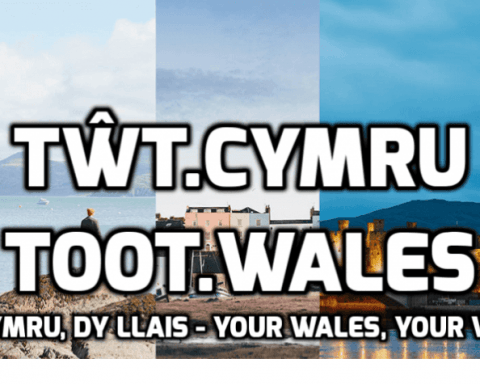 Mi wnaeth Aran rannu ei farn ar nation.cymru. 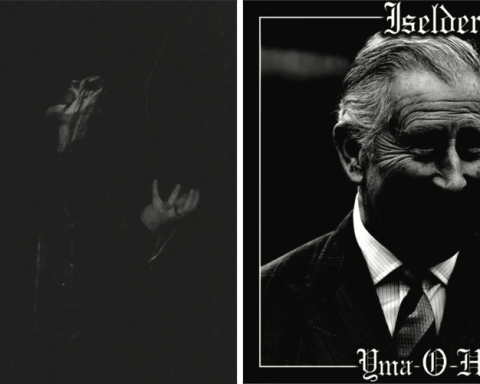 Wedyn wnaeth ein gohebydd dderbyn neges oddi wrth Mr Vine. Er gwaetha’r beirniadaethau, mae Mr Vine yn sylweddoli bod y rhan fwyaf y gymuned yn hapus efo ei gefnogaeth a sylweddoli ei fod o'n ddyn sy’n gwerthfawrogi ieithoedd a diwylliant. Ar ôl trafod y sefyllfa, mae ein gohebydd yn hapus i ddweud mai dyn onest ydy Mr Vine, ac mae parallel.cymru yn falch o dderbyn y cyfle i gyflwyno ei brofiad. The repeat of the phone call went out in the break between Xmas and New Year. 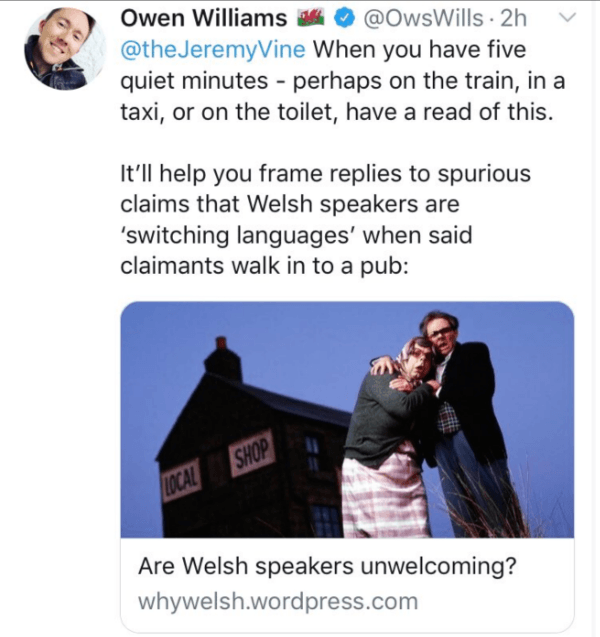 The caller created quite a bit of online anger, including from someone who tweeted me directly to say that his complaint about Welsh being spoken in pubs in Wales was like a Brit complaining about French being spoken in a bar in Paris. Here I made my classic (holiday) mistake! Thinking we could have some fun debating this point, I asked “Is France in the UK?” ... simply as a way of pointing out that the analogy wasn't a very good one. This tweet (if you're still following me) suddenly popped up in the feed of Leanne Wood, who I must say I have a lot of time for. Shorn of all context it must have looked pretty crass. 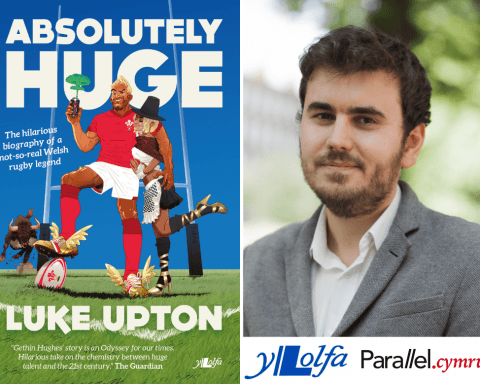 I woke up the next morning, saw the scores of angry responses, realised I was in the middle of a classic pile-on, and deleted my France tweet to spare anyone else the agony. And that last comment came from someone whose hobby, I suspect, used to be fighting in pubs before they discovered Twitter. I followed the uproar carefully, and where I could reply or contextualise I did so. But in the end you can’t stop some people hearing what they want to hear. That’s their right. The upside is this. Watching these exchanges, which took on a life of their own on day two, with separate individuals hurling insults at each other and me now hardly involved, I made some genuinely friendly acquaintances. 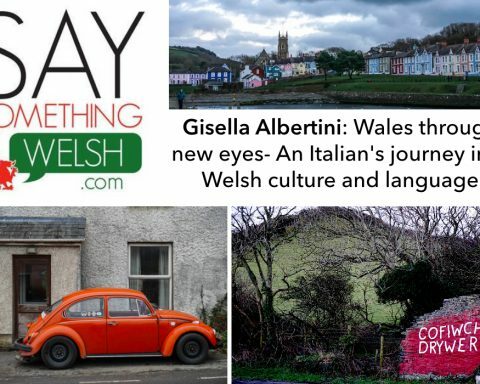 The author of this blog, @pedrapiago ... @aranjones whose “high intensity Welsh language training” I would love to try, if there’s ever time: https://www.saysomethingin.com/ ... Welsh AM @neiljmcevoy and MP @jonathanplaid. Plus @owswills who used to be BBC and is a great guy. Oh, and this blog was truly heartwarming https://nation.cymru/opinion/why-we-shouldnt-shout-at-jeremy-vine/. That’s Aran again, and I’m grateful. So it’s not all bad. I know a lot of this was my fault and I’m not trying to underplay that. But the key thing is to keep talking — in whichever language we prefer. I love the diversity of this tiny island we live on. 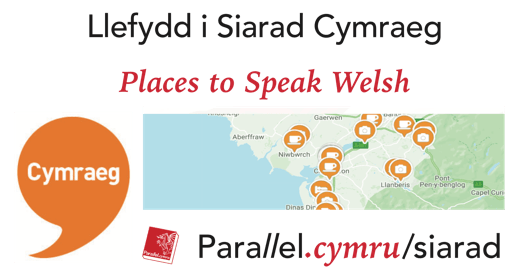 Parallel.cymru editors: Thank you Jeremy for engaging with the Welsh-language community, and we appreciate you taking so much time and interest to understand and clarify the issues raised in this Tweetstorm.